An ambitious bill written by the utility and wind power lobby was unanimously killed yesterday in Augusta by a legislative committee. LD 1513 would have undone an established law that protects ratepayers from large companies seeking to control the market for electricity generation and transmission. Transmission utilities like Central Maine Power Company and Emera Maine were prohibited from owning generation plants when the Restructuring Act was passed 16 years ago. In the last three years utilities and wind generators have brought controversial cases to the Maine Public Utilities Commission and the Maine Supreme Judicial Court, because the companies sought to do enter "affiliated interest" relationships, in which companies held by joint ownership sought to partner on generation projects requiring expensive transmission expenditures for delivery of the power. 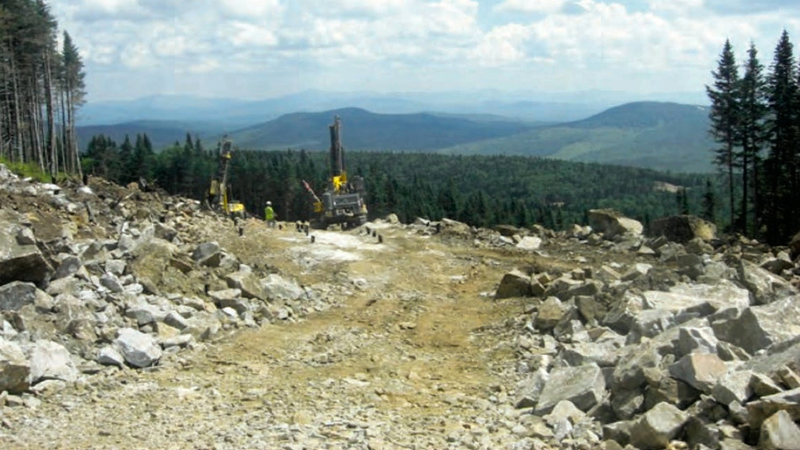 Friends of Maine's Mountains (FMM) has opposed all of these attempts because power producing companies have an incentive to build generators in remote areas far from population centers, while utilities that are essentially sister companies have an incentive to build transmission lines hundreds of miles long. FMM convinced the legislature that this market control is bad for ratepayers, and especially bad for mountains that have been targeted by wind development. LD 1513 was written by Central Maine Power, it's parent company Iberdrola, an affiliated company called Iberdrola Renewables, America's second largest wind developer. Emera Maine assisted. A consortium of LD 1513 opponents led by FMM included Anthony Buxton of the Independent Energy Consumer Group and Ben Smith of Houlton Water Company. Opponents provided forceful and compelling testimony both at a February public hearing and a March 8 work session. See FMM's testimony here. Chris O'Neil, FMM's Director of Government Affairs said: "After several language revisions and attempted amendments, the Committee finally said, 'No way. We don't need or want the sort of market dominance that LD 1513 enables.' We are pleased that Maine's ratepayers and environment won a big one yesterday." FMM has welcomed recent reports that wind developers are losing interest in Maine. O'Neil added that this defeat should send a message to policymakers in southern New England. "We were astonished a few weeks ago to learn that 51 renewable energy projects are being considered in an RFP process, and that many of those projects would have catastrophic consequences for Maine, all to provide insignificant amounts of expensive electricity to meet arbitrary requirements" in Massachusetts, Rhode Island, and Connecticut. "Now, with defeat of LD 1513" O'Neil said, "some of those projects are less likely to be completed or even proposed, and we in Maine couldn't be happier if killing this bill also kills those horrible projects under consideration in the RFP." When your roof is caving in, don't spend your paycheck on lawn ornaments! The New England Grid is changing rapidly. Large workhorse generation stations are retiring in big numbers. That can be good, as lots of those are dirty old coal and oil plants in Southern New England. But it's also bad, because when we have to build new generation facilities, our light bills will increase. While Maine has the third cleanest electricity generation fleet in the nation, and while New England as a region is also very clean, in the last few years we have made a push for lots more wind generation. Well for starters it ruins some of Maine's most special places. And wind turbines are hundreds of miles from electricity customers, so all those new transmission lines will really whack our light bills. And of course, closing base-load nuke and coal plants reduces our ability to reliably keep the lights on. A thousand new wind turbines in Maine cannot perform the crucial work performed by one nuke plant like the soon-closing 680 megawatt Pilgrim Nuclear Plant in Massachusetts. Even after we spend billions on new wind turbines, we will still need to invest in new base-load and peak-load generating plants to run the grid. This would be very costly. Continuing to dump billions of dollars into remote wind and its corresponding transmission lines is like a homeowner blowing her paycheck on patio furniture while there is a growing hole in her roof. If we want more renewables, lets stick to renewable generation that is dispatchable and scalable… you know... the useful stuff: hydro, biomass, rooftop solar, tidal, etc. This infographic from the New England Grid operator clearly illustrates the pickle we are in if we keep wasting our money on "patio furniture"
Emergency facing Maine’s energy ratepayers! Tomorrow, March 3, 2016, the Legislature’s Committee on Energy & Utilities could be asked to vote for a disaster. Do you trust big corporationS to use the honor system? If this bill passes, it could result in another Big Wind blitz on rural Maine. Utilities like CMP will be happy to spend billions on unnecessary new transmission lines to accommodate the useless wind projects. And we'll pick up the tab. CMP says LD 1513 is just meant to clarify the law. Friends of Maine’s Mountains was recently a party to a lawsuit in which the existing and very necessary legal restraint played a crucial role, and the truth is, the law is very clear: they can’t do it. And for good reasons. Let’s STOP this sneaky attempt to skirt a good law protecting Maine citizens. For an in-depth article about how deeply corrupt Maine wind companies are, click here. Then please contact the Legislative Committee HERE and tell them to protect Maine’s electricity ratepayers, and stop destroying Maine’s environment and economy: LEAVE THE LAW IN PLACE! Wind developers are NOT HAPPY that Maine citizens are asking for a restoration of their property rights. CLICK HERE FOR STORY. WCSH-TV in Portland and WLBZ-TV in Bangor, sister stations that have the largest media audience in Maine, aired a story a few days ago about petitions that have been submitted to the state’s Land Use Planning Commission by the Moosehead Region Futures Committee. Long story short, the petitions are a critical step in restoring land use rights and protections that were stripped from a tiny percentage of Maine people when Governor John Baldacci signed the Wind Energy Act into law in 2008. That is EXACTLY what we are trying to do, and we hope it works. Because “investment” that depends so heavily on taxpayer and ratepayer subsidies, that produces no real benefits to the people of Maine, that threatens the state’s economy --- is investment that SHOULD be driven off, with a vengeance. Clearly, wind opponents are making an impact, and getting under the industry's skin. This petition process might be one of the most effective tactics to date in the long fight to keep giant wind turbines from ruining Maine’s most pristine mountains and wild areas. Congratulations and sincere thanks to the Moosehead Region Futures Committee, as well as dozens of other individuals all over rural Maine for their hard work gathering signatures. Of course it would be remiss not to thank the hundreds of citizens who convinced the Maine Legislature to make the petition process possible. If you’d like to learn more about the petition process and get personally involved, a good place to start is “Wind energy to suffer another blow in Maine,” a blog post Friends of Maine’s Mountains published in late December. Let’s keep the pressure on! Watch this video if you’d like a brief summary of the likely goings-on in Augusta during the upcoming legislative session. REPORT on the upcoming legislative session. We all have to be vigilant and share information. Count on FMM to always be investigating what’s going on in the hallways and hearing rooms at the Statehouse, at the regulatory agencies, and in the courts. And of course, we’re always happy to know what YOU are hearing out in the field. If you ever want to pass along information, please feel free to reach us at mainemountainfriends@gmail.com. (Weld, Maine) Earlier this month, the Maine Supreme Court handed wind industrialists a landmark defeat. Now, a Maine environmental group is following that up by mailing instructions this week to 6,000 registered voters in Maine’s unorganized territory, part of an educational campaign to explain how to "opt out" of Maine's Expedited Permitting Area for Wind Energy, also called the Expedited Area (EA). Funded and distributed by Friends of Maine’s Mountains (FMM), the mailer spells out how residents of the state’s most remote townships and plantations can obtain a petition from the Maine Land Use Planning Commission (LUPC). With very few signatures, petitions can remove all or part of these localities from the Expedited Area, which means that any future wind development would need to win zoning approval from LUPC before it applies for a permit. Wind projects proposed in these areas are currently not required to do so. The unorganized territory comprises the majority of the state’s land mass, but it is home to just one percent of the population. The EA was shrewdly created in a little-understood maneuver of the Maine Legislature, when it unanimously passed the Wind Energy Act in 2008. Lawmakers wanted to make it quicker and easier to build industrial wind turbines in rural Maine. The net result was that a tiny percentage of Maine people were stripped of land use rights and protections that citizens in the rest of the state enjoy. More than 50 Maine towns in other parts of the state have adopted protective wind energy ordinances since 2008, but residents of the unorganized territory lost the ability to do the same, the moment Governor John Baldacci signed the Wind Energy Act into law. O’Neil said opposition to wind projects has escalated significantly since the Wind Energy Act passed, but because the Act remains law, applications filed for projects in the Expedited Area are effectively rubber-stamped as they navigate the process to secure a permit. He said that by getting enough signatures on a petition, wind opponents in that part of the state will be able to regain their rights. “The required number of valid signatures is low, just ten percent of voter turnout total in the last gubernatorial election. So a township in which twenty people voted in 2014 would only need two signatures to secure an effective remedy and opt out,” O’Neil said. O’Neil warned that there is one catch --- there’s a very short window of time in which LUPC will accept petitions, from January 1 through June 30. He said residents can start gathering signatures now, however, and that at least 25 petitions are already circulating. FMM mailed the instructions Friday, so residents will begin receiving them in the next few days. Friends of Maine’s Mountains (FMM) is a nonprofit organization that opposes the environmental and economic destruction from industrial wind energy. For more information: http://www.FriendsofMainesMountains.org. 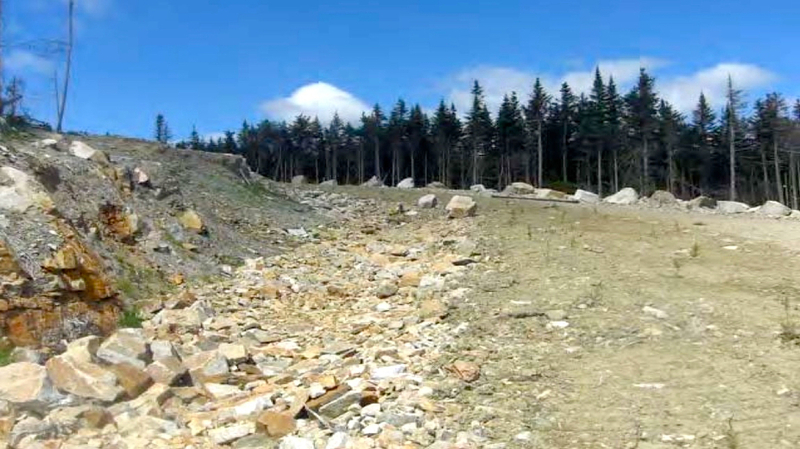 WABI reports on the damage inflicted in Maine by out-of-state wind moguls. Don't be surprised by this TV news report by WABI-TV in Bangor, in which residents of these small Maine towns express their indignation that an out-of-state wind mogul is damaging their lives and not affording them simple respect. Then, below, click on the gallery and take a look at these stunning photographs taken in Vermont by Roger Irwin and Steve Wright. SHOCKING. They illustrate very plainly what it really requires to erect an industrial complex of giant wind turbines on the top of any mountain. 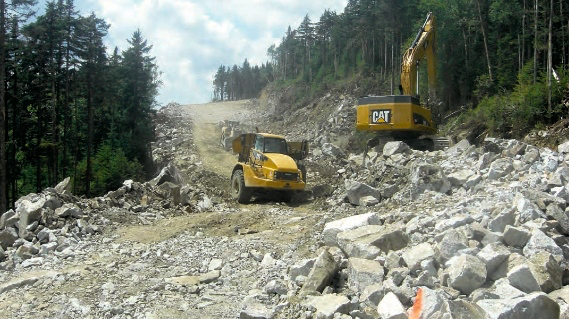 In Vermont and in our state, it requires the destruction of scenic mountains, FOREVER. Maine’s economy depends on the tourism dollar. Hikers, skier, campers, hunters and leaf-peepers are tourists who value Maine's natural resources very highly. 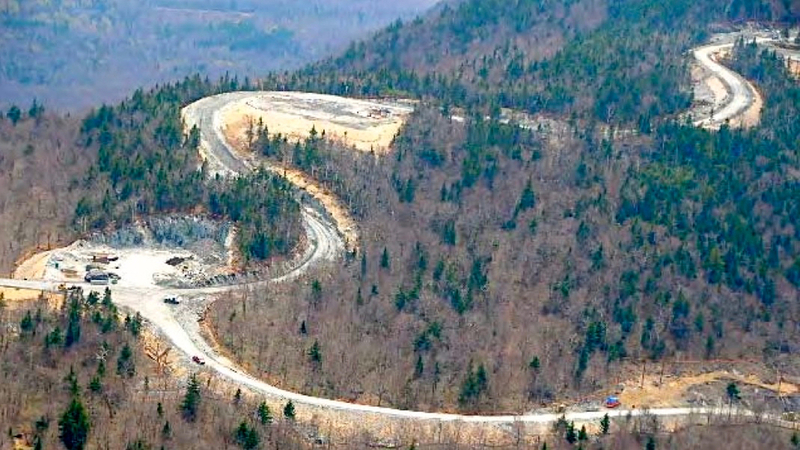 But unknown to most Mainers, as industrialists are destroying the state's most precious natural resources, turbine electricity generated on Maine mountains is going out of state to Massachusetts and Connecticut. In Maine, turbines do nothing to get us off oil, because our electricity already comes from overwhelmingly clean sources. And imagine the damage that clearing forest land for transmission lines, which will cost Maine people billions, will inflict on taxpayers and ratepayers here. Just so our neighbors to the south can sanctimoniously claim they're using "clean" energy. Should you be alarmed? Yes. Many thanks to Peak Keepers of Vermont’s Mountains for publishing their fine online brochure, and for bringing this grave threat to our attention. CLICK on gallery below.